Barry Louis Polisar and his family settled into their seats at a Bethesda movie theater as the overhead lights dimmed and the stream of movie previews gave way to soft-drink slurps and the munching of buttered popcorn, just before the movie’s opening number. “Shhhh!” said the couple’s 20-something twins, Evan and Sierra, perhaps recognizing their father’s urge to be incognito. He worried about how his 1977 song “All I Want Is You” would be featured in the then-newly released motion picture, Juno – and whether more than 30 years as a children’s author and entertainer would be tarnished by a momentary mocking of his work on the big screen. As it turns out, Polisar’s worries couldn’t have been further from reality. Not long after the Silver Spring resident left the theater, he discovered that the Juno spot had garnered him more mainstream attention than any previous milestone, which included playing at the White House and being the host of a nationally syndicated children’s TV show. Polisar’s MySpace page, which had 15,000 hits before the release of the film, has had about 150,000 since. Visitors have downloaded “All I Want Is You” from the page nearly 30,000 times. His song is referenced on Google 7,900 times and has been featured on the video-sharing Web site YouTube. What’s more, eight couples from around the country have contacted Polisar requesting permission to use his song during their wedding – including two couples from California who offered to fly him out to sing it. “It’s a real eye-opener what national exposure can do,” said Polisar, 53, still amazed at how one motion picture has made a contemporary hit of a song that he released when Jimmy Carter was president. In addition to adults remembering “All I Want Is You” from their childhood, many hearing the song for the first time are eager to know the voice accompanying the gushy ballad’s acoustic guitar and harmonica. The song is played during the opening credits of Juno, a critically acclaimed film about a razor-tongued teenage girl confronting an unexpected pregnancy. The film has grossed $85 million since its Christmas release and received an Academy Award nomination for best picture last week. “All I Want Is You” is the first song on the Juno soundtrack, which is No. 1 on the iTunes soundtrack chart and No. 3 on the Billboard 200 chart. Most have known him as an eccentric, sardonic entertainer who educates youngsters while teaching them it’s all right to laugh at yourself, poke fun at your parents, dislike your teachers or play tricks on your siblings. Occasionally, he crafted songs about love and friendship. “All I Want Is You” is about a man hoping to win his true love’s hand in marriage. “All I Want Is You” plays as the film displays animated images of the lead character Juno (Ellen Page) drinking a jug of Sunny Delight while retreating to the store for her umpteenth pregnancy test kit. 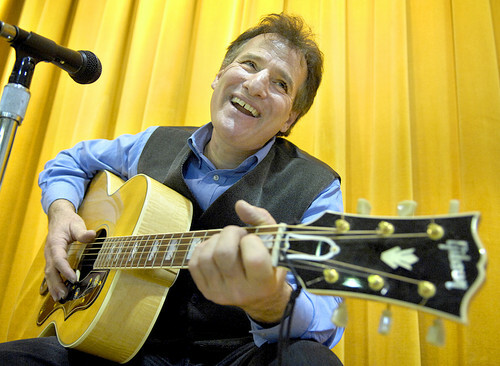 Polisar has made of living of crafting such songs since he launched his career in 1975, while attending the University of Maryland as a literature and film major, with hopes of becoming a teacher. Friends who had heard his catchy kid songs encouraged him to record them, and he ultimately made two albums, the second of which contained “All I Want Is You.” Polisar offered the albums at $4 each and managed to sell a combined 50,000 copies. From there, he’s made a living recording albums and writing children’s books – with such titles as Dinosaurs I Have Known, The Haunted House Party and Peculiar Zoo. Poems from the latter book were featured on former First Lady Barbara Bush’s national radio show on ABC, Mrs. Bush’s Story Time – eventually leading to a concert appearance at the White House in 1991. Others who have used Polisar’s songs include the rock band Radioactive Chicken Heads, who have recorded a music video of his song “I Looked Into The Mirror, What Did the Mirror Say?,” which they covered on their debut CD in 2005. Currently, Polisar has more than 350,000 recordings and publications in print. He also was host of the syndicated children’s show about educational travel, Field Trip, from 1994 to 1997. The show won two Emmy Awards. But he’s most noted for making appearances to elementary schools throughout the country and at schools for American military families in Germany. Since 1975, he’s delighted young audiences with his unique brand of music, poetry and prose. But that’s when he can dictate how his work is to be presented. Before Juno’s release, Polisar called Reitman, concerned that the movie’s lead character might be shown turning off a radio in disgust as “All I Want Is You” played. Even after being assured that his song would be treated favorably, Polisar was apprehensive as he headed to the theater.